Police Explorer Cadet Applications Now Being Accepted! A limited number of Police Cadet slots are now available for new applicants interested in the program. If you're interested in becoming a PPD Police Explorer Cadet, download and send in your application without delay! The Philadelphia Police Explorer Cadet Program is now accepting applications for 2019. The application period will be open from 4/6/19 through 9/7/19. 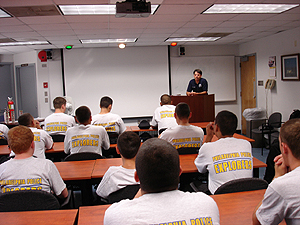 What is the Police Explorer Cadet Program? The goal of the Police Explorer Cadet Program is to teach young adults the values needed to succeed in a law enforcement career and in life. 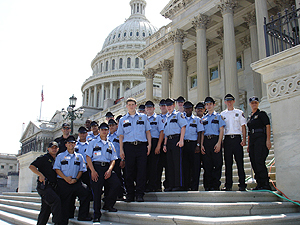 The Philadelphia Police Explorer Cadet Program is designed to introduce young adult men and women 14 to 20 years of age interested in pursuing a career in law enforcement to the profession. The program is structured to provide law enforcement training and experience to the Explorer Cadet through mentoring, classroom instruction, and hands-on training. 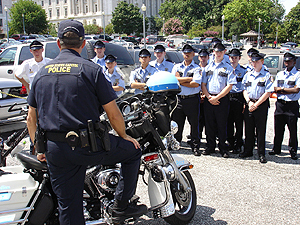 When Cadets reach their nineteenth (19) birthday and desire to continue in the field of law enforcement, they are encouraged to apply to the Philadelphia Police Department and participate in the testing process. 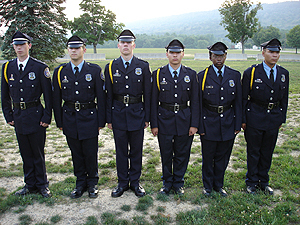 Cadets must have reached their nineteenth (19), birthday at the time of appointment to the Philadelphia Police Academy. · applicants who are 14 years of age must be enrolled in high school. Applicants must be able to speak, understand, read and write the English language. Explorer Cadets who are under eighteen (18) years of age are required to have a signed consent form from their parent or guardian. Have no arrests or convictions which would prohibit employment as a police officer. Be in good physical health and be able to participate in physical activities. Must maintain a passing behavior or character grade while in high school. Must be able to attend mandatory Saturday training sessions. Physical Training (PT) Assessment: Once the application has been received you will be contacted by phone with a date for a PT Assessment that will evaluate your physical agility for those who wish to become Police Officers. This will be used to measure your physical accomplishments throughout the year as we condition and prepare you to be in peak shape for the entrance test for the Philadelphia Police Academy as a hired police recruit officer! Please bring a completed copy of the Physical Fitness Waiver and Release from Liability Form with you when you come for your PT Assessment. Candidates under the age of 18 should insure that the form contains their parent/guardian's signature. • copy of your last report card or transcript. In addition, you must bring information for three (3) references (not family related) which includes name, address, phone and /or letters of recommendation. You may also bring any other awards or certificates you have received to the interview. Any applicant who is involved or was involved in any legal, criminal and/or civil court proceedings must bring all available paperwork documenting and explaining the incident. Examples include (but are not limited to): arrest, school suspension/expulsion, custody, protection from abuse orders, any expunged records, and parking and traffic violations/payments. If under the age of eighteen (18) the applicant must have a parent or guardian with them during the interview. o Applicants must dress in business attire or school uniform. o No jeans or sneakers permitted. o No Jewelry permitted except for wrist watch. o Males - should arrive clean-shaven with hair neatly trimmed. o Females - should come with hair pulled away from their face. If the applicant successfully passes the first interview, they will be given a date and time for the second interview. They will receive a Police Explorer Questionnaire booklet (P.E.Q.) that must be completed and brought back to the second (2nd) interview. 2nd Interview: Candidates returning to the second interview will bring any necessary paperwork and the completed P.E.Q. Booklet. During the 2nd interview the interviewer/s will review the booklet with you and/or your parent/guardian if applicable. Applicants will be notified of acceptance into the program after carefully reviewing all testing, documentation and background check. Any false or misguiding information provided of any kind, including past criminal behavior or school discipline behavior, will be denied. Induction Ceremony: Candidates that are accepted will be required to purchase their uniform equipment and will report to our induction ceremony where they will be sworn in by the Philadelphia Police Commissioner. 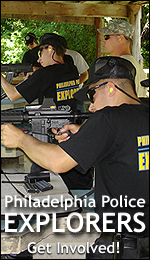 The Philadelphia Police Explorer Cadet Program is designed to introduce young adult men and women 14 to 20 years of age interested in pursuing a career in law enforcement. The program is designed to provide law enforcement training and experience to the Explorer Cadet through mentoring, classroom instruction, and hands-on training. "Pennsylvania State Police Youth Week"
The Explorers, sophomores and juniors, will receive a chance to attend State Police Youth week sponsored by the American Legion at York College, York Pa in June. 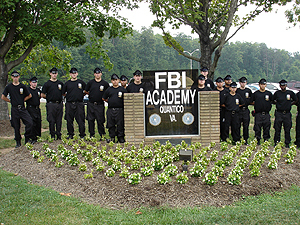 It is a six day camp used to introduce cadets in all procedures of law enforcement. It is to prepare cadets thru moral, intellectual, and physical aspects to become future leaders of the commonwealth and instill in them courage, honor and commitment. 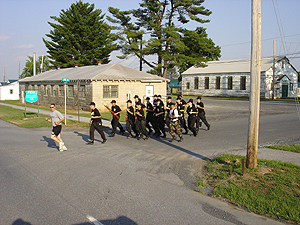 "Fort Indiantown Gap Summer Boot Camp Training"
The Explorers stay for a week in July at Fort Indiantown Gap Military Base and receive additional, more intensive, training by law enforcement, emergency service agencies and the military. 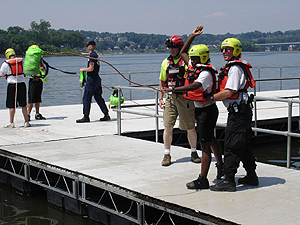 They receive training in law enforcement procedures and fire and water rescue techniques. 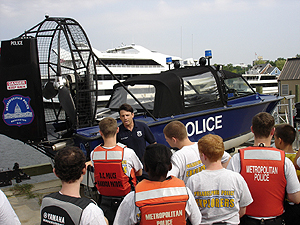 "Washington DC Law Enforcement Training and Educational Tours"
• Prince George County Police Dept. • D.E.A. and F.B.I. • Enon Tabernacle Baptist Church Saint of Valor and Holiday Parties. · Provides the Explorer Cadets with training and knowledge required of various law enforcement procedures and the laws.
. 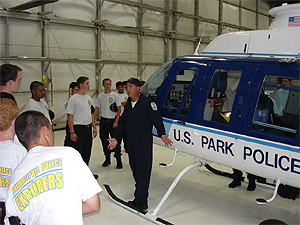 Provides any explorer who completes a minimum of two (2) years of service in the program, which includes 672 hours of training, the passing of physical fitness graduation standards and 298 hours of community service or external training, with three (3) preference points to be applied to the Philadelphia Police Recruit examination. In addition, Explorer Cadets who successfully complete the Philadelphia Police Explorer training program will have the 60-credit college requirement for the position of Philadelphia Police Officer waived. · Provides community service hours/credits required for high school graduation. decides to join the U.S. Armed Forces. · Prepares the individual for physical agility test required for all law enforcement agencies. · The opportunity to tour/train at various law enforcement and correctional facilities and academies with local, state & federal officials. The mission of the Police Explorer Cadet Program is to guide young adults to a better path for the future through training, leadership, teamwork, discipline, friendship and to assist the Philadelphia Police Department and the citizens of Philadelphia through community service. 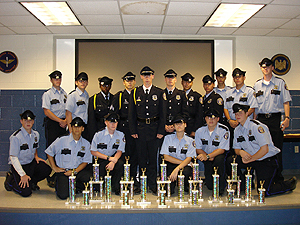 "Philadelphia Police Foundation" in care of the Philadelphia Police Explorers Program. Visit our Flickr Photo Gallery! © 2019 Philadelphia Police Department — All Rights Reserved.